Explore Bali comfortably and safely with Bali Bike Rental. More than just renting out scooters and motorbikes on the Beautiful Island, we also offer add-ons to fully compliment your adventures on Bali. Enjoy WiFi coverage everywhere on the island, document aspects of your trip with the GoPro and for peace of mind make use of the premium motorbike insurance offer. When you book with Bali Bike Rental you can be sure that you rent a motorbike or scooter with the most trustworthy rental company in Bali. We offer 3 types of packages to serve different needs of different customers. Our scooters and bikes range from 110cc to 150cc (Honda Scoopy, Honda Vario, Kawasaki KLX D-Tracker and Yamaha R15). All our scooters and bikes are less than 1-year-old and get an extensive quality check before delivery. • We deliver your order anywhere on Bali; to major parts of the island delivery is free. • 1 or 2 sanitized helmets are included and so is a medical kit with every scooter or bike. • Since we deliver with a full tank of petrol, offer unlimited mileage on all our motorbikes and scooters there's no need to worry about driving restrictions. • Optional accessories like a hard case or side bags are available for possible longer trips. • A mobile phone holder is included gratis. Combined with the available portable WiFi you can use your phone as a GPS throughout the island. • A GoPro to capture your favorite moments can make your experience on Bali unforgettable. 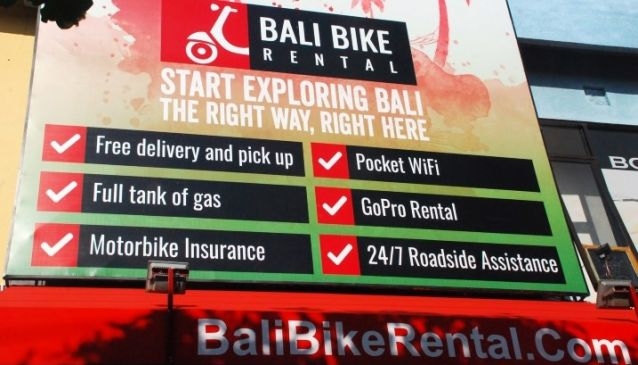 At Bali Bike Rental we truly care, our professional employees are dedicated to making your travel experience easier and more comfortable. After all, when you spend your vacation on this wonderful island you quickly learn that scooters and motorbikes are a fun and affordable way to get around. All our employees speak English and we are ready to help you 24/7/365. All you have left to do is ride carefully and enjoy your exciting Bali tours, since we will take care of the rest!